Hemp Health: Touted for its insoluble fibre protein and essential omega 3 fatty acids, hemp seeds are often called a super food due to its many health promoting benefits. According to Manitoba Harvest's Mike Fata, the plant protein has all ten essential amino acids and is easily digested. It also benefits cardiovascular health, can lower blood pressure and cholesterol and reduce arthritic swelling. Manitoba Harvest's five products include hemp hearts (similar to pine nuts); cold-pressed hemp seed oil; hemp butter; hemp protein powder; and hemp bliss (non-dairy milk). Hemp Gourmet: Manitoba chefs are embracing hemp. Hemp seeds are used as a coating on local picker fish cheeks served at the Misty Lake Lodge in Gimli and sprinkled on wood-fired pizzas at Whytewold Emporium. The Delta Winnipeg's Blaze Bistro makes a goat cheese, grilled mango, white balsamic and hemp seed appetizer while The Current at Inn at the Forks uses hemp seeds in its organic salad. And the cleverly named Fude features hemp-crusted fish dishes on its menu. Even canines are indulging in hemp -- Smack Pet Food makes dog treats and dog food with hemp. Hemp Beauty: Hemp oil is used as a cure for eczema, stretch marks, scalp itch and a balance for cell development (it's a highly absorbent vitamin E carrier). Manitoba companies such as McCuaig Solutions and Zona Verde Cosmetics are making face lotions, body butters and hair care products from hemp. 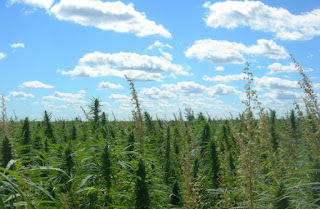 International brands Lush and Dr. Bronners use Manitoba hemp in its products. You can even make your own hemp products such as hemp oil, sea salt and lavender scrubs and hemp oil shampoos and conditioners. Hemp Apparel: It's often described as "strong enough for a sailor and comfortable enough for a yogi." Michael Krahn's Fishlips Hemp Company is a retail store in Gimli, and sells hemp hoodies, hats, t-shirts, socks, running shoes, wallets, rope, twine and even paper. Another retail shop is Hempyrean in The Forks Market in Winnipeg. Owner Mike Carriere says hemp clothing is more durable and an organically friendly alternative to cotton. His store carries shirts, shorts, yoga clothes and pants in a rainbow of colors.